Review: Do you like magical mysteries? How about romance, with a magical twist? 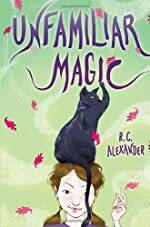 R. C. Alexander's debut book, Unfamiliar Magic, is full of laughs, suspense, and teenage confusion. Desi is a witch, but her mother won't let her practice magic almost at all. For years, ever since she was little, Desi and her mother had to move from house to house almost every few months. When Desi's mother has to go away for some unknown reasons, Desi's familiar, her cat, Devil (Devalandnefrail) has been told to watch over her. Before Desi's mother had left, she had given Devil a potion that turned her into a human, which Desi had given her the name Catrina, or Cat for short. This story is a book of their adventure, of Cat learning human ways, and of Desi finding romance in the oddest of places. This is R. C. Alexander's first ever published novel, which is a standalone book. Desi wants to practice magic. After all, she is a witch. But her “overprotective” mother won't allow her to do any magic, unless her mother is doing most, part, or all of it. When Callida (Desi's mother) has to leave for unspoken reasons, Devalandnefrail is left in charge of Desi, in the human form of Cat, or Catrina. Cat starts to fall in love with the next door neighbor's eldest boy, Bob, who also has huge feelings for her. At first, Cat only wanted him for two things, transportation to get sushi, and means to pay for sushi. Desi is trying to wrench the reasons for her mother's departure out of Cat, who won't tell Desi anything. Desi is also starting to fall in love, with the neighbor's younger boy, Jarrett. He also seems to like her, but Desi isn't sure. Cat is trying to learn the ways of humans, and Desi is trying to keep Cat from doing anything else stupid or putting the rest of the family at risk for being exposed as the witches they really are. As Desi tries out new and unfamiliar magic spells and potions, she finds that they aren't as easy as they seem. While Desi struggles to accomplish her overall task, to find her mother, she learns new things along the way. This book will be fun for the whole family. Unfamiliar Magic is a book that the whole family could enjoy. From magic to romance, this book would be directed more to the female audience. The main character shows that even on their own, people can uncover new things. Desi and Cat, or Devalandnefrail as she is also called, learn that things are not always as they seem, too. Out of five stars, I would give this particular one five and a half out of five, because I just couldn't stop reading. Look out Harry Potter, there's a new witch on the way! With every word I read, every chapter, I became more and more engrossed in it. I would absolutely love to find out if there were any more about Desi after this. We would like to thank Random House for providing a copy of Unfamiliar Magic for this review. Have you read Unfamiliar Magic? How would you rate it?